On August 11, white supremacists rallied in Charlottesville, Virginia against the removal of the statue of Confederate general Robert E Lee. In the wake of that rally, which turned deadly when a rally-goer plowed his car into a group of counter-demonstrators, killing one and injuring 19 others, there have been calls across Amerika to remove Confederate monuments. Those monuments – over 1500 of them – are being assailed because most were erected between the 1890s and 1920s – decades after the Civil War – not to honor the war dead, but rather to celebrate the reassertion of white supremacy across the South and the defeat of Reconstruction. The mainstream media has closely covered these events and politicians who have been going on record with token renunciations of America’s past practices of white supremacy and slavery. However, both the media and political class have remained totally silent about the systemic practice of both slavery and racism by the U.S. government today as a core feature of its so-called criminal justice system, and the growing protest movement against it. Actually the Charlottesville events happened just a week before August 19, the date of the planned mass rally in Washington DC against mass imprisonment. This rally and the growing movement of which it is part, are aimed at dismantling not merely symbols of past racism and slavery like Confederate monuments, but the 13th Amendment which still authorizes slavery today and is directed predominantly against people of color. But who questions the legitimacy of imprisonment in Amerika? It’s supposed to be about removing from society and rehabilitating those who have been duly convicted of crimes, right? Not hardly. From the Black Codes enacted across the South immediately after the Civil War, to today’s drug war and “law and order” agendas, criminal convictions enabled by the 13th Amendment, have been targeted predominantly and consciously at people of color – New Afrikans/Blacks in particular – to reproduce slavery. This systemic racism and injustice has only recently begun to come to public attention. This began in part when the legal insider, past U.S. Supreme Court law clerk and civil rights attorney Michelle Alexander, published her expose The New Jim Crow, in 2010, which revealed the methods by which the criminal justice system deliberately targets people of color for mass imprisonment and insulates itself from challenge. Then came struggles launched by prisoners themselves against the systemic abuses of U.S. imprisonment, like the three historic hunger strikes led by California’s prisoners in 2011 and 2013, in which 6,000, 12,000, and 30,000 prisoners respectively participated. This effort brought international attention and opposition to the widespread use of the known psychological torture of solitary confinement. Further collective acts of resistance followed, drawing more public awareness and support, including two prisoner-initiated work strikes; first in Texas in April 2016, then a nationwide strike in which tens of thousands of prisoners across Amerika participated beginning on September 9, 2016 – a date chosen to commemorate the 1971 Attica prison uprising. These work strikes succeeded in exposing the existence of antebellum-style slavery in U.S. prisons. A condition long-concealed by the media and prisoncrats, while U.S. officials have long denounced human trafficking and slavery in other countries. Furthermore, the U.S. wrote and ratified Article 4 of the Universal Declaration of Human Rights at the end of World War II, which outlaws all forms of slavery. Typical U.S. hypocrisy. These exposures and prisoners’ resistance struggles engendered the budding outside movement against the abuses and slavery of U.S. mass imprisonment. 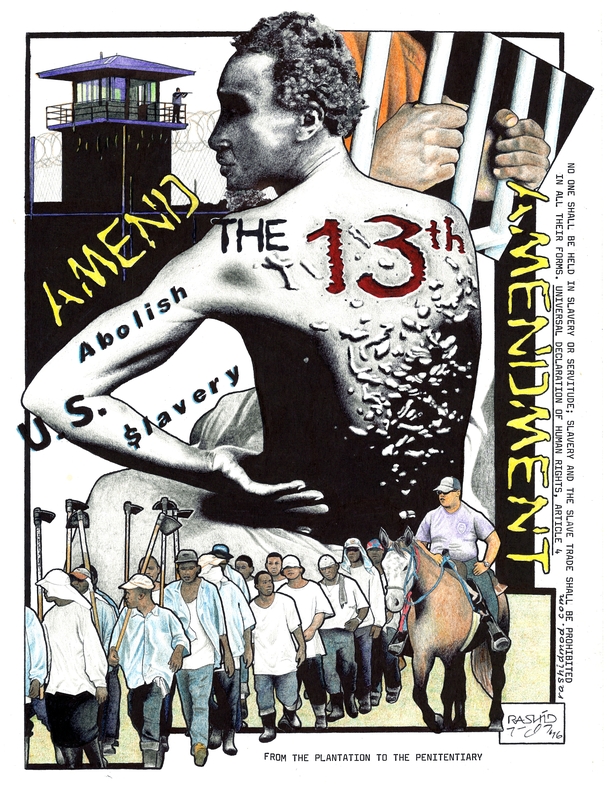 The documentary film 13th by Ava Du Vernay pinpointed the 13th Amendment as the 1865 Constitutional law that modified, but did not abolish, slavery. It only changed slavery from a status based exclusively on race to one imposed upon conviction of crimes. But the passage of the 13th Amendment did not end the racialized character of U.S. slavery. Instead, criminal laws were created and selectively enforced to target Blacks in particular. At base, the 13th Amendment served to give the power to own and regulate slavery to the government instead of private persons, which made the condition more deadly for the enslaved than under private ownership. As Karl Marx observed, when slaves can be readily replenished from a relatively inexhaustible human pool, they are typically worked to death. This is what the state did with convict slaves who were put to work on chain gangs, prison plantations, and most notoriously, leased out to private plantations and corporations. Texas led in implementing and expanding the convict slave model, which, like chattel slavery, has relied on retribution and brutality as the only viable method of enforcement. This model, which many Southern states followed, came to be known as the Southern prison model. In parallel, a Northern prison model also arose, which had its birth in Pennsylvania’s Eastern State Penitentiary. This system, under the influence of Quakers, devised as a “humane” approach to imprisonment, the use of solitary confinement to rehabilitate prisoners as penance for their wrongs, (hence the name “penitentiary”). Regardless of this ruling, the use of solitary confinement continued, and spread at an unprecedented level during the post-1970s prison boom, which saw the construction of super maximum-security prisons and segregation units across the US. Today over 80,000 prisoners in Amerika are held in solitary confinement. The Southern prison model, although more openly brutal than the Northern model, has received much less public exposure. The convict leasing system, for example, proved particularly barbaric. While the number of Blacks lynched in the South from 1880 to 1930 are numbered by the Tuskegee Institute at 3,220, the number that died during the same period from the abuses of convict leasing were over 30,000. U.S. officials and the media have generally concealed the routine practice of brutality and slavery in Amerikan prisons. When they do talk about U.S. prisons and their functions, they are typically portrayed in idealistic terms drawn from the Northern model as institutions of rehabilitation and humane treatment, rather than as places of horrific abuse, mental retribution, and slave labor modeled on the old Southern slave plantations. “[Texas prisons present] a uniquely harsh model of criminal justice, a regime of state-sanctioned punishment based on roughshod legal proceedings, racial subjugation, corporal punishment, and unpaid field labor that has persevered into the 21st Century. Texas’s plantations are ‘probably the best example of slavery remaining in the country,’ reported a national corrections expert in 1978. Twenty years later, when I first started visiting southern prisons, I reached the same conclusion. Nowhere else in turn-of-the-millennium America, could one witness gangs of African American (sic) men filling cotton sacks under the watchful eyes of armed whites on horseback. Plantation prisons at Sugar Land, Huntsville, and elsewhere have preserved the lifeways of slavery in carceral amber. During the 1800s and early 1900s, when racism was openly practiced, the Northern Model concept of ‘humane’ and ‘rehabilitative’ prisons was reserved for white prisoners, while the southern model of brutal retribution and slavery was for Blacks and Mexicans. In my experience, having been imprisoned in the majority white ‘Northern’ prison system of Oregon from 2012-2013, and then in the majority black and Mexican/Chicano ‘Southern’ Texas and Florida prison systems from 2013 to the present, I’ve seen these models still applied along the same racialized lines. In Oregon, prisoners are not forced to work, although those who do work are paid only pennies per hour. Oregon also emphasizes rehabilitation through a range of privileges and programs, while using particularly severe solitary confinement as discipline and segregation. Florida, a notorious Texas wannabe, also forces its prisoners to work, most without any pay. Physical abuse, especially frequent violent killings of prisoners by guards, is probably worse than in Texas. In only two months of confinement in Florida’s prison system, I have talked to scores of prisoners. Most who’ve been confined in the Florida Department of Corruption (FDC) for a decade or more have witnessed guards murder at least one prisoner, usually by group beatings and/or staged suicides (in effect, lynchings). I have also had ranking FDC guards and even mental health staff boast, or admit knowledge, of such killings. In fact I was confronted on my first day in the FDC by a mob of guards making death threats against me. FDC also imposes a particularly severe system of solitary confinement in its disciplinary and segregation (or “close management”) units, where prisoners are compelled to remain absolutely silent inside their cells under threat of disciplinary infractions; strip cells (being left in a completely empty cell for a minimum of 72 hours with nothing but a pair of boxers), and physical assault with gas, up to a cell raid by an armored team of guards. In my brief FDC confinement in solitary, I have witnessed all of these measures (except cell raids) used against prisoners repeatedly, simply for talking. I have been threatened with them numerous times for talking also. It has been long recognized that extreme abuse is the only way prisoners can be compelled to remain absolutely silent. The experiment was tried in New York prisons in the 1800s, as in Pennsylvania. Although the two Northern systems differed in certain respects, New York’s was more extreme, and unworkable, in attempting to enforce absolute silence. In this context, the extreme abuse and killings of Florida prisoners by guards is inevitable. Today’s US mass imprisonment is no more legitimate than, and is just as scandalous as, the old trans-Atlantic slave trade and in many respects they are analogous. The old system saw millions of Afrikans hunted, kidnapped and transported in the holds of ships to be enslaved in the Americas. A process which caused Afrika to suffer, just as with Black communities today under mass incarceration, massive depopulation and social destabilization. Police operate much like the slave catchers. The judges, prosecutors and court appointed “defense” attorneys operate as the slave auctioneers and traders, who keep the inexhaustible supply of human bodies cycling into Amerika’s slave camps. The jails and sheriffs operate as the slaveholders who confine the slaves until they are ‘sold.’ Once sold, the prison guards and administrators are the overseers. As for who the ‘owners’ are – the Virginia Supreme Court made this clear in its 1871 ruling of Ruffin v. Commonwealth, where it held that prisoners are “slaves of the state.” As said, this is the only change that the 13th Amendment made to slavery – the state instead of private persons became the owner and regulator of slaves. All that is required today to ‘sell’ one into slavery is the technical ‘conviction’ of a crime. A process that is as vile and arbitrary as are the conditions under which prisoners are held. In a 2016 article in Prison Legal News magazine, Chris Hedges exposed the downright corrupt method by which the vast majority of U.S. prisoners are ‘convicted’ of crimes. Rather than being tried and convicted by a jury of one’s peers as the Constitution assures every person charged with a serious crime, 97% of federal convictions and 95% of state felony convictions are produced by the accused being coerced and threatened by court-appointed defense attorneys, working in collaboration with prosecutors and judges, into pleading guilty. A process euphemistically called “plea bargains”, “plea negotiations”, etc. In most cases, the prosecutors lack sufficient evidence – or any evidence at all – to convict the accused. But because the accused can’t afford to hire an attorney who will genuinely fight for them as the laws require, millions are cycled into U.S. prisons and reduced to slavery. At every level and stage the U.S. criminal (in)justice system is illegitimate and but a continuation of the long train of evils that Amerika was founded and built on: Native genocide, land theft, slavery, racism, systemic poverty, a campaign of continental conquest. All the same aspirations and methods of the German Nazis for which they are universally reviled. But only because unlike Amerika – from whom the Third Reich drew its inspiration – the Nazis failed. Like the monuments on display across Amerika, such as those of Confederate general and Ku Klux Klan founder Nathan Bedford Forrest, who regained his fortune after the Civil War using convict labor, slavery today and the 13th Amendment must be dismantled and relegated to the museums where their full and true histories should be taught. “The mostly Black, Hispanic and Native American prison populations [in Amerika] are ground down by cruel and unusual punishment while being denied a political voice and basic human rights and dignity, and are subjected to exploitation by the multinational corporations as a cheap labor force. This has nothing to do with rehabilitation. You can’t teach citizenship through slavery! Many prisoners embraced this call and it is now being taken up by the general public, who are slowly awakening to the reality that slavery and its targeting at people of color and the poor is still in wide practice in Amerika. It is as evil an institution today as it was 152 years ago when it was portrayed as having been abolished, but wasn’t. Instead, it was enshrined in the 13th Amendment and continued as a hidden practice behind walls of concrete, steel and razor wire, where the public could not see. We must build and continue the struggle until this “peculiar institution” has been completely demolished. The FDC has been repeatedly featured in the media concerning questionable prisoner deaths and in 2014 was cited for a record number of deaths. See, for example, Greg Allen, “Record Number of Inmate Deaths Has Florida Prisons on the Defensive,” All Things Considered, (National Public Radio, March 18, 2015, 5:56 PM ET).